Buffalo County was named for its chief river, Beef or Buffalo, so designated because of the former presence of that animal in the vicinity (Gannett, Place Names, p. 55). Buffalo River was named by Father Louis Hennepin in his voyage up the Mississippi (1680); see Thwaites, Hennepin's New Discovery (Chicago, 1905), p. 222, where the explorer calls it "River of Wild Bulls" and on the accompanying map, it is designated "River of Oxen." The French voyageurs called this stream Riviere des Boeufs; hence its present designation, Beef River. Buffalo County is located within the Drift less Area of Western Wisconsin, and was founded in 1853. Buffalo County is named after the Buffalo River, which was named in 1680 by Father Hennepin. French voyagers called the river "Riviere des Boeufs," meaning beef or Buffalo. The 42nd largest County in the State, its boundaries on the south, west , and east are formed by the Mississippi River, and in part, by the Chippewa and Trempealeau Rivers. Buffalo County presents a diversity of scenery, unsurpassed by any other County in Wisconsin. Buffalo County, also offers beautiful valleys of unsurpassed fertility, bordered by towering bluffs on all sides, which in the summer when covered in foliage, offer a view of scenery rarely equaled. 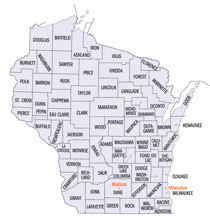 This County was organized in 1853 from Chippewa. It lies on the Mississippi River at the mouth of the Chippewa, and is rapidly filling up. It is at present but sparsely populated, and there is much good Government land to be had. The valleys of the Trempeleau and Buffalo Rivers are extensive and eminently adapted to agriculture--fine prairies, fine timber, well watered, and as yet almost entirely unoccupied, presenting one of the best openings for the immigrant to be found in the State of Wisconsin. 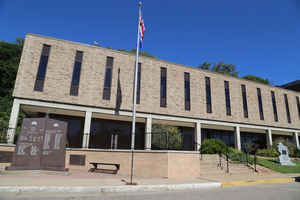 Waumandee City is the County Seat of this County, situated on the Mississippi, about 50 miles above La Crosse. It is a promising point of business, and will probably command the trade of this and the Northern part of Trempeleau Counties. Buffalo is in the La Crosse land district, and consequently entries can only be made at the La Crosse office. As reported by the Census Bureau, the county has a total area of 710 square miles (1,838 km2), of which, 684 square miles (1,773 km2) of it is land and 25 square miles (65 km2) of it (3.54%) is water. Mostly oak savanna (bur oak, white oak and bluestem). Northeast: white, black, and red oaks. Along the Mississippi River: willows, soft maple, and ash.